Fred Flare always has the "funnest" things. 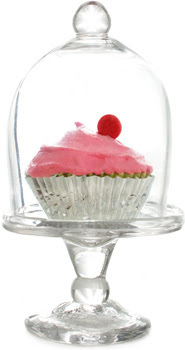 Isn't this handblown cupcake stand delightful?! Not super practical but, oh so charming! i just found that blog, too, via the blogger's comments. :) love that cupcake stand. Darlin...but what do you do with all the other cupcakes? Ohhh yeah...eat 'em up!